During Victorian times Brighton had a pub on virtually every corner. Over the decades the numbers of pubs in Brighton have dwindled. Even more so now, with the prices of alcohol rising and the ban on smoking in pubs, the numbers are falling fast. Over the years I have managed to capture a few that have now long gone and captured some that are still there but are no longer pubs. Some I have added just because they're pubs and still pubs! Kemp Street. Number 29 was the Blue Anchor pub from at least 1869 up until c.1910. After this many businesses operated from this building such as butchers and hairdressers. Lovely to see the pub has been commemorated with the Blue Anchor plaque. Above: The Northern Tavern. Ditchling Road. 2012. Ditchling Road. The Northern Tavern was in existence from at least 1862. It closed c.2012. Above: The Hampden Arms, Hampden Road. 2016. 12 Hampden Road (off of Elm Grove). It began life selling beer as early as 1875. By the 1880's the Gilder family were running this pub. The first mention of the Hampden Arms was in the street directories of 1888. It seems the Gilder family ran this pub up until its closure in c.1970. 104 Islingword Road.On the corner of Islingword Street. Run by Louise Worger and her family from the 1870's until the 1910's. By 1937 the pub had gone. The premises became a Pawnbrokers. Above: The Horse and Groom, Islingword Road. 2015. 129 Islingword Road. The earliest mention I could find in the street directories was in 1862. Ran by George Budgen up until c.1876. After this J. Page was the landlord from c. 1876 - late 1930's. The Horse and Groom closed in 2015. 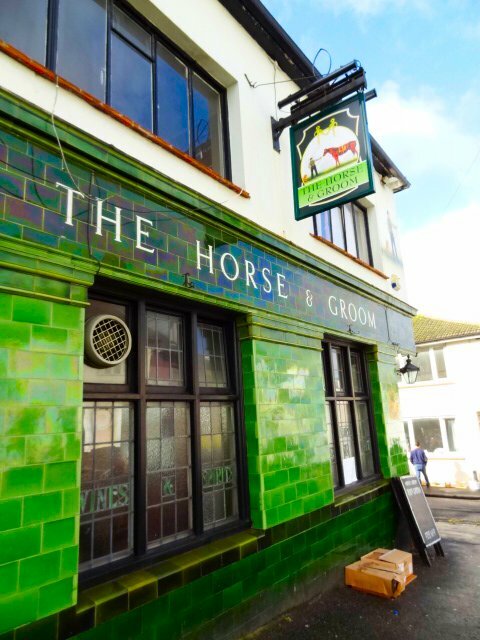 Currently there is a petition to re-open the Horse and Groom. Above: The London Unity, Islingword Road. 2018. Landlord names include J. Measor from the 1870's. T.N. Snelling and Henry Bridger during the 20's and 30's. 132 Islingword Road. 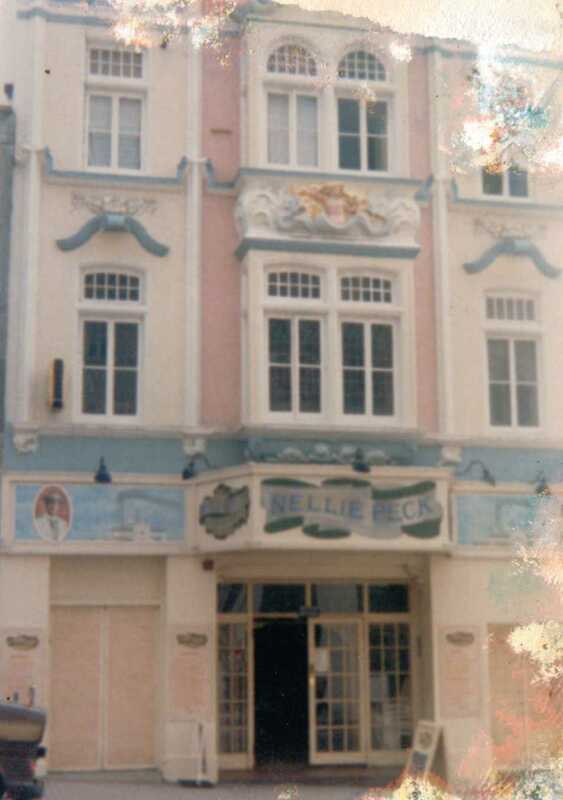 The pub had ceased trading here from the mid 1950's. 27 Islingword Road. In existence here from at least 1869The pub had closed by the mid 1930's. Above: The Derby Arms, Islingword Road. 2018. 28 Islingword Road. A couple of Landlords worthy of a mention were Walter Golden who ran the pub during the early 1900's and the Banks family who ran the pub during the 1920's and 30's. The Derby Arms remained open until the mid 1950's. 40 Islingword Road. The Gardeners Arms was in business here until the late 1940's. In business from at least the 1870's. 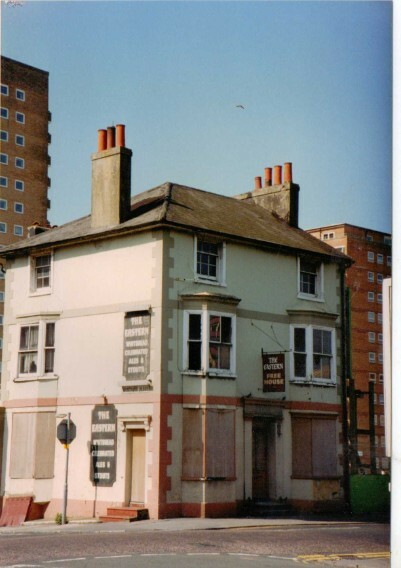 Main landlords and Landladies were Mrs Mitchell during the early 1900's then W. Stockwell took over the pub until around the time it closed in the late 1940's. W. Stockwell went on to run the Constant Service after this. There is a lovely photograph of the Gardener's Arms on the Regency Society's Collection by James Gray. his pub was rebuilt c.1870's. Before King's Road was built, this pub stood on the cliff edge. Originally known as the Ship-in-Distress. In 1822 it was renamed the Sea House. Finally demolished in the early 1990's. Above: The Eastern pub, Eastern Road. 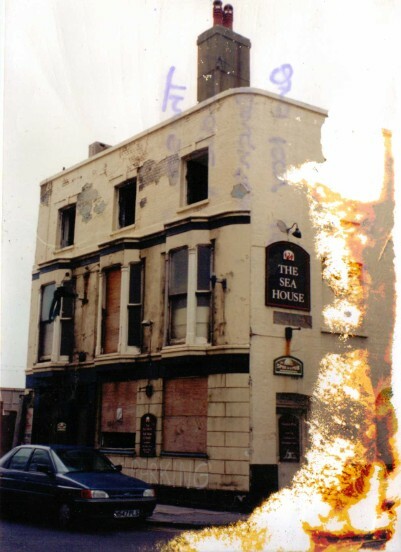 1993 Prior to demolition. 106 Eastern Road on the corner of Montague Place . The earliest record I could find for this pub, then known as the Eastern Tavern was 1848. Reed Ockenden was the landlord. By 1872 it's name was changed to the Eastern Hotel. The landlord being H Betts. I am unsure when the pub closed. I know it was still up and running in the late 1970's. 76 Trafalgar Street on the corner of Blackman Street. The Coachmakers was in existance from at least the 1850's. W. Carter ran the pub from the 1850's up until the 1880's. The photo I have taken here is from 1990. I am not sure when it ceased trading but this pub survived some 140 years! Pretty amazing. Above: The Coachmakers Arms, Trafalgar Street. 1990. On the corner of Belgrave Street and Albion Hill.The Spread Eagle was at this address from at least 1864. The Morling family were landlords here up until 1887. Other landlord names such as Henry Reed, E.G. Cowley, George Titchener, Alfred Idel and Harold Victor Osbourne. This pub was once the brewery tap for Tamplins brewery. The stone pillar attached to the pub was once the gated entrance to the Phoenix Brewery. Closed in 2010 after complaints to the council regarding the noise. 99 North Road. In existance from at least the 1870's. The Red Lion Tavern as it was known seemed to have had many, many landlords over the years. Above: The Red Lion North Road. 2011. 65 Ditchling Road. Corner of Francis Street. This stretch of Ditchling Road from St Peter's to Viaduct Road was originally called Brunswick Place North. This changed to Ditchling Road sometime during the 1890's. The North Star popped up sometime in the 1860's. The earliest record I could find was 1864 when the pub was run by Ann Gates. Many different landlords over the years Frederick Laurence Herriott, James Deacon, J Hillman and many others. Notably though, the pub was run by William Charles Hayward from 1918 and continued to be run by the Hayward family right up until at least the 1970's. I have yet to find out when the pub closed or whether the Haywards continued running it until its closure. This Pub was originally the Seven Stars Inn. The earliest directory I could find was 1845 where the landlady was Sarah Matilda Stonham. 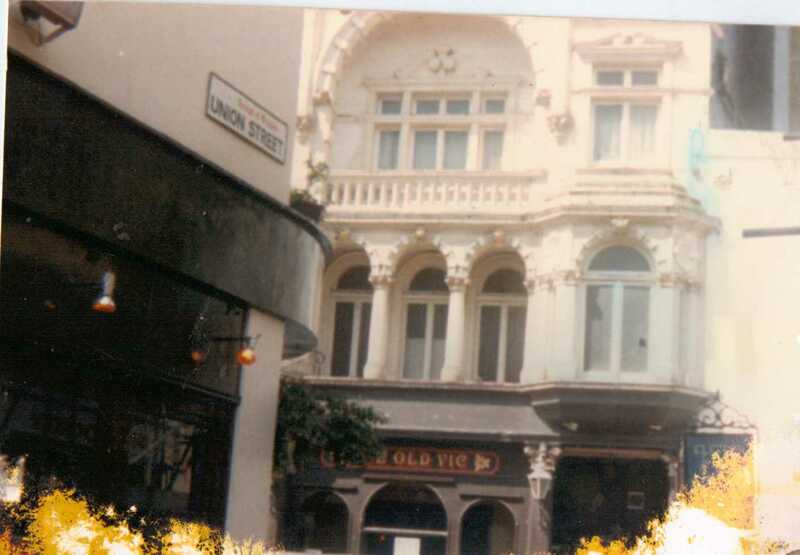 The pub remained the Seven Stars up until the 70's/80's when it was renamed the Old Vic. For a time in the 1990's it was called Helsinkis. I am glad to say, very recently it has reverted back to its original name of the Seven Stars. Cranbourne Street. The earliest record I could find of the Cranbourne Arms was in 1852. The landlord at the time was Abraham Leney, a Lewes man. He lived here at the Cranbourne Arms with his wife Ann and their children Hannah, Abraham and Martha. Only in recent times has the pubs name been changed which seems a shame. It has been around for the past 160 odd years. 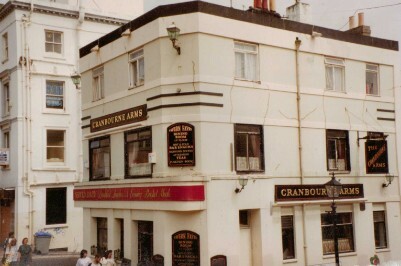 Above: Cranbourne Arms, Cranbourne Street 1993. Sussex Street. No longer a pub. Now converted into housing. A pub was here from at least the 1850's. Back then it was known as the Plumbers Arms. By the 1860's it had become the Lion and Unicorn, a name kept right up until it's final days as a pub. Not the original pub as this was rebuilt late 1920's by John Leopold Denman. Above: The Lion and Unicorn, Sussex Street. 1995. In existance from at least 1865 as the Alliance Inn. For around forty years from the 1890's up until the 1930's this pub was run by Patrick James Cunningham and his family. Originally from Ireland Patrick lived here with his wife Alice and their four children. Their son Percy took over as landlord. Edward Street and the corner of Cavendish Street. This pub dates back to 1800. No longer in use as a pub. Elm Grove. Recently known as the Bib and Tucker. Closed in 2012. Now student housing. On the corner of Cobden Road. It was a public house from at least 1881. The Gillam family ran the United Service from c.1908 up until the 1940's. Closed in 1964. On 52 Elm Grove and the corner of Howard Road. Now converted into housing. The earliest record of the Flying Dutchman I could find was in 1854 when it was run by D. Sayers. In 1871 The Flying Dutchman was run by Charles and Louisa Phelps. They only stayed a few years before the pub changed hands. 1891 Henry Rose and his wife Louisa were running the Flying Dutchman up until c.1908. From 1910 and for the next twenty years the landlady was Mrs Louisa Mary West. From 1933 right up until at least the late 1950's the Flying Dutchman was run by Frederick Dean. Closed during the 1970's. I do have a small recollection of this pub as a child. Above: The Elm Grove Tavern 2014. 32 Elm Grove. On the corner of Milton Road. The earliest record of the Elm Grove Tavern I could find was in 1854. William Woolgar ran the Elm Grove Tavern from 1891 until 1914. Originally from Henfield William was a farmer in Petworth before coming to Brighton to run the Elm Grove Tavern with his niece Mary Botting. For a short time from 1881 this pub was run by Charles Phelps and his wife Louisa who had previously run the Flying Dutchman and the Balcony Tavern in Elm Grove. During the 1970's I remember this building being the Tooting Tyre Service. Above: The Balcony Tavern, 2014. Originally numbered as 144 Elm Grove, this changed in c.1884 when the houses in Elm Grove were renumbered probably due to new buildings being erected. The first mention of a pub at this address that I could find was in 1872 where it is described as a Beer House. Ran by George Harwood briefly. It wasn't until 1880 that it is first mentioned as the Balcony Tavern. (possibly named because it is the only property on that stretch of Elm Grove with a little balcony). In 1875 it was being run by Charles Phelps who previously ran the Flying Dutchman. 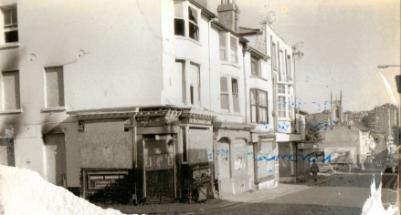 After running the Balcony Tavern, Charles Phelps went on to run the Brighton Tavern, just up the road on the corner of Milton Road. 1881 saw the Balcony Tavern being run by William Stanford and his wife Sarah. 1901 The pub was being run by John Goodman from Winchester and his wife Harriet. In 1903 the pub closed and the following year number 20 Elm Grove became a Greengrocers. Above: Upper Gloucester Road/Guildford Street. 2010. Elm Grove. Still operating as a pub. Now renamed the Cornerstone. Listed in the directories from at least 1852. At that time ran by William Marchant. From c.1859 Listed in the Folthorpe Directory as the Race Hill Inn, livery and bait stables with the landlord being Walter Tilley, who remained here until c.1888. Now the Park Crescent Surgery. Above: The Racehill, Lewes Road. 2012. East Street. 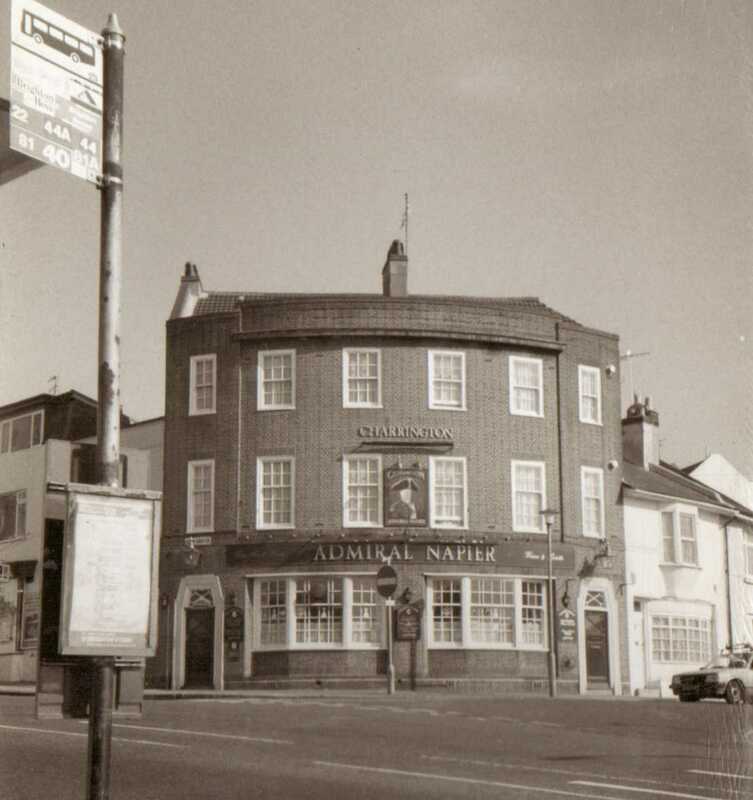 The original Inn was known as the Blue Anchor which dated back as far as 1658. Now the Fish Bowl. 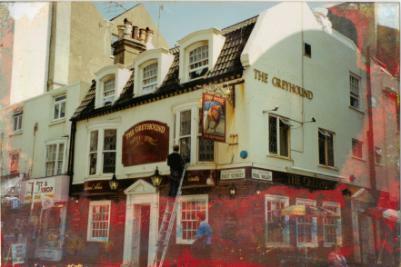 Above: The Greyhound, East Street 1992. Originally the Carpenters Arms. The earliest mention in the directories that I could find was 1845. However it could very well be much older than that. During the end of the nineteenth century the Carpenters Arms was being run by a man named John Christie. Christie's is what it was called from c.1900 up until the late 1960's. Above: Nellie Pecks, West Street. 1987. 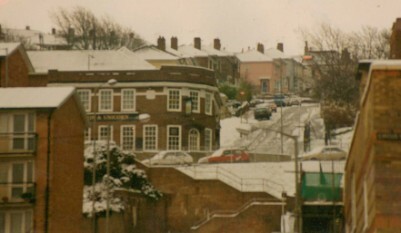 Above: Devonshire Arms, Carlton Hill. 2013. Mentioned in the local directories from at least the 1870's. Many changes of landlords and ladies over the years but one notably was Henry Smith who ran the Devonshire Arms from c.1886 up until c.1921. Above: The Cuthbert, Freshfield Road, 2014. Freshfield Road started life as Park Road East. The Cuthbert Inn was mentioned in 1880 as being run by T. Gorringe. This only lasted until 1881. From 1882 onwards it was now known as the Cuthbert Hotel ran by J.W Hall. The Hall family ran the Cuthbert Hotel up until the late 1950's. Writing this in 2014 the Cuthbert has now closed. I am not sure if it will continue as a pub or like many others be converted into housing.